The 355th Wing Staff Agency Close Airmen Support team poses for a photo March 15 at Davis-Monthan Air Force Base. Each team is comprised of members from the Mental Health clinic, Airmen and Family Readiness center, the Chapel, representatives from the Sexual Assault Prevention and Response office, and master resiliency trainers. The diversity of each mission set is necessary. It is vital that the CAS teams are tailored to the individual needs of every group and squadron. Davis-Monthan Air Force Base Airmen are known to be strong, resilient and hard-charging. Time and again the base has proven to be one of the best and has never backed down from the high-end fight. The base and Airmen have gone through many changes that have resulted in a higher operation tempo with very little room to fail. However, all of the hard work and dedication our Airmen provide can come at a cost. Retired Chief Master Sgt. Vincent Howard, 355th Wing chief community support coordinator, along with commanders across the installation, have taken notice of the effects these new challenges bring upon our Airmen and their families; and are taking action. After a year of studying and research, Howard and the CAT found there were two specific areas where Airmen were struggling that could lead to the self-destruction that commanders wanted to prevent. With this new research, the team was able to determine what they needed to do to meet the commander’s intent. “Each agency agreed to give up members that would have a positive impact on these targeted areas. And each group is given dedicated CAS members with a first sergeant as the lead,” Howard said. The intent is to have the lead first sergeant meet with their group’s leadership to determine what areas the CAS team needs to focus upon. 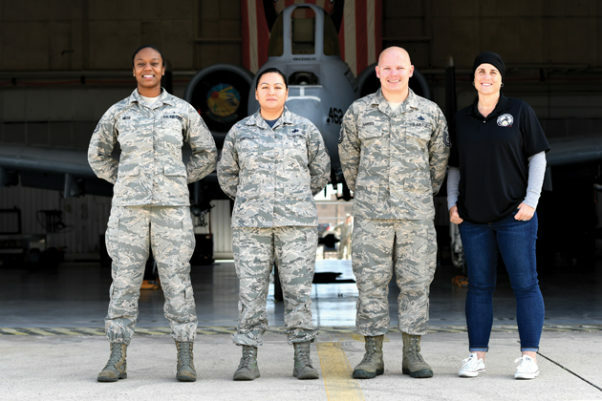 Given the diverse mission set Davis-Monthan AFB presents, it is vital that the CAS teams are tailored to the individual needs of every group and squadron. As this initiative is still new, there is plenty of room for it to grow. However, Howard is confident that over time it will prove to be the life-saving vital resource our Airmen need to continue the high-end fight and maintain readiness as well as lethality.